I’m very excited about Nikon’s latest video teaser! “It feels just like a DSLR but physically it’s totally different, because it’s so lightweight”. Specifically “because it’s so lightweight”, he didn’t just say lightweight he said it’s “so lightweight”, meaning more than lightweight – very lightweight? And I believe that’s a really important clue about what’s coming. The Canon T7i weighs in at 1.17lb (532g), while the M50 weighs just 0.86lb (390g) so it’s hard to believe that the new Nikon will be anything at all like Nikon’s D850 which weighs more than 2.5x Canon’s M50 mirrorless at 2.22lb (1005g) – it’s very intriguing to say the least. This surely has to mean that in 3 days time Nikon will be revealing a camera designed to compete with Canon’s M50 mirrorless body that’s priced at around USD $799. That said don’t expect a Nikon priced at $799, it’s just not gonna happen, the price will be significantly higher. If the new Nikon is a Canon M50 competitor then it will surely have better features, including non-crippled 4K functionality. In fact, the video already reveals that the new camera will be compatible with Nikon’s F series lenses, which means it already has a major advantage over the Canon M50. The M50 has got a lot of negative attention across the major YouTube channel reviews because of it’s crippled 4K functionality, namely it’s dreadful autofocus and horrible cropping and lens lineup. My gut-feeling is that the M50 is about to get slaughtered, but I guess we’ll have to wait another few days to see. Of course an even bigger question remains and that’s “Could the new Nikon be aimed at competing with Sony’s A7 iii?” if so then the whole game is about to change. Imagine that… a Nikon to compete with the A7 III, now that would be truly amazing. However, Sony has set an incredibly high bar, and in my opinion as of right now the Sony A7 iii is the absolute best camera on the market and it’s extremely unlikely anyone will unseat it anytime soon. I’m really looking forward to seeing what Nikon has got lined up for us, some other manufacturers definitely need to start competing with Sony’s A7 III just because “it’s that good” and in my humble opinion that’s the direction the whole market should be going in, and I hope that’s what Nikon is up to. Images of the upcoming Nikon mirrorless cameras and lenses have leaked! The images include two bodies, as well as images of the mounted lenses being announced along with an F-to-Z mount adapter. The lenses look to be a 24-70mm f/4 lens, a 35mm f/1.8, and a 50mm f/1.8, with the zoom likely being a kit lens. All three lenses come with an “S” designation. The top three pics are of the Z7, while the bottom three are the Z6. Pricing and specifications leaked via Nikon Rumors. 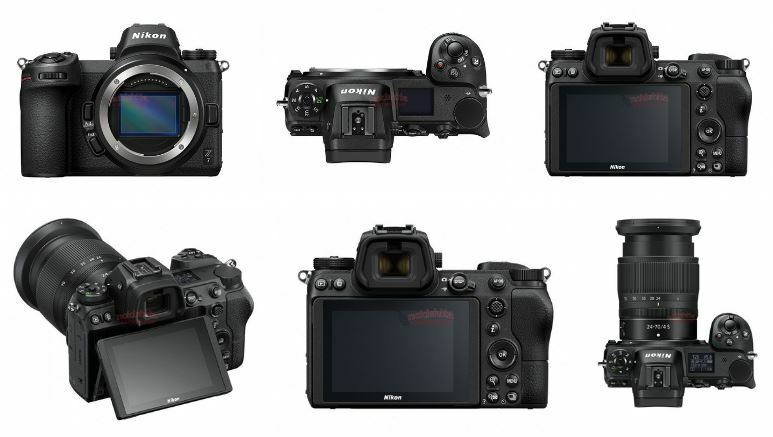 Nikon D850 vs. Nikon Z6 vs. Nikon Z7 specifications comparison according to Nikon Rumors. Here’s the video of Nikon’s announcement event, pretty much confirming what I thought in my earlier video.